In-camera HDR blending. This is an interesting one, though much more for the snapshooter rather than the serious HDR enthusiast. The HDR mode exposure brackets multiple images (three, or five shots) and combines them, producing an overall image with far greater dynamic range than a single shot could ever produce. Jack Howard at the Adorama TechTock blog has produced an extensive post on the K7’s in-camera HDR ability – while it won’t come close to replacing dedicated on-computer HDR processing, it can produce a decent result, which might be good enough for many, and could be useful for those just looking to capture a slightly larger DR, rather than creating a full-on HDR effect. Unfortunately, and somewhat perplexingly, the HDR mode can only be used to produce regular JPEGs. Live-view. The K7 now features contrast-detection AF, and interestingly enough a face detection mode. And before you know-it-all “pro” photographers laugh, face detection is a genuinely useful feature – while you’re pulling out every trick and technique in your bag to get the correct focus and adjust for exposure, a K7 user in live view mode simply uses face detection to focus lock onto faces and automatically optimize the exposure for portraits. Rotational shake-compensating sensor IS. This is a pretty interesting one, though details are a bit muddy on how it’s actually done. Pentax uses sensor-based image stabilization, which typically involves shifting the sensor laterally to compensate for camera shake. The sensor-based implementation has the advantage of staying with the camera no matter what lens is used, which is a huge boon since lens-based IS often puts a heavy premium per-lens, and many classes of lens don’t even have an IS version. However, one of the criticisms of sensor-shift systems thus far is that they’re not as effective, partially due to the fact that they shift only laterally, which in theory corrects only lateral shake – a far more minor factor of blur compared to rotational shake over longer distances. If this is true, and the new IS system works, we might expect significantly improved performance, especially using telephoto lenses/working over long distances. TAV mode. This feature was present on the K20D as well. It’s a frankly genius adaption to digital technology, and one that I’ve been clamoring for ever since I first picked up a digital camera – TAV mode is an autoexposure program mode (in the vein of Aperture-priority and shutter-priority modes) which allows for manual selection of both aperture and shutter speed – the ISO then floats to whichever sensitivity necessary to produce the exposure. For anyone shooting low-light on a consistent basis, this is a program mode absolutely made for you (choose the aperture and lowest shutter speed you’re willing to live with, and this program mode will optimize for noise). Interval timer. Nikon has had this forever, but it’s a feature sorely lacking on just about all the other systems – a built-in interval timer allows the K7 to do time-lapses all on its own, without requiring some absurd $100 add-on *cough* Canon *cough*. 5.2 fps continuous shooting. Pentax finally caters to the sports/action market with its first high-FPS camera – previously the fastest you could get on a Pentax was 3fps on the K20D. 5fps isn’t exactly blazing, especially compared to 6 or 8fps seen on even the midrange Canons and Nikons, but it’s just about the standard minimum you’ll need for faster sports. Though I wouldn’t run out and dump my Canon system for Pentax just yet – they’re still sorely lacking in the telephoto department without a single 70-200ish f/2.8 lens, much less any of the big tele primes – it’s now an appealing option for casual enthusiasts, with lenses like the Pentax 200mm f/2.8 prime, a very nice 60-250mm f/4, and of course a plethora of options from Sigma and Tamron. In-camera leveling. One of the more unusual features of the K7’s is the ability to rotate and level images in-camera. This isn’t a cheap software rotation trick, mind you – the sensor, combined with an electronic level, actually rotates up to 2 degrees in either direction to maintain a flat horizon. This is a pretty huge boon for landscape photographers, who can now level their images with a mathematical precision far greater than just eyeing it with the viewfinder and gridlines. Weather-proofing. Like the K20D before it, the K7 offers exceptional weather-proofing, unlike the D90 which has none and the Canon 50D which has it on paper only. Additionally, even the budget kit lenses (the 18-55 standard range and 50-200 tele) will be weather-sealed. One of the more interesting specifications is that the K7 is rated down to 14 degrees fahrenheit (-10C), compared to just 32F/0C on virtually every other “weather-sealed” camera on the market, which includes bodies like Canon’s 1D(s) and Nikon’s D3. This might make it an interesting camera for extreme travel conditions, where even the rugged “pro” bodies experience significant failure rates. Overall the K7 is an interesting camera – while Nikon has been forging straight ahead in the high performance, blow-you-away image quality department, and Canon seems to have been stumbling around aimlessly, and new #3 Sony continues churning out junk cameras selling on brand recognition alone, it’s nice to see an old name making a comeback, and in a way that blows past the competition, not just catching up to it. The K7 carries with it a lot of new innovations – not necessarily in the Panasonic/Samsung “we’re building the ultimate digital imaging device, not a camera” train of innovation, but in a more traditional way that fully leverages digital imaging and electronic hardware for photographic purposes. So you’ll still find a mirror here, and somewhat disappointingly a lack of articulating screen and higher-ISO capability (the K7 caps out at ISO1600, with +2 boost to ISO6400), but also sensible innovations such as in-camera leveling, TAV mode, full-frame video capture, and live view fact detection, that don’t necessarily revolutionize digital imaging as we know it, but provide subtle improvements and aids that optimize traditional photographic technique. The K7 slots in at $1300 for the body, compared to $1200 for the Canon 50D, $1000 for the Nikon D90, and $1800 for the D300. It’s not a camera that will really compete with the 50D or D300 on the action front, but for general photography it packs a number of interesting features that simply aren’t found on any other cameras. If image quality holds to the same level as the K20D, the K7 should be in the same class as the other cameras here (i.e. top of the class among APS-C size sensors) – better than the 50D, and perhaps a little worse than the D90/D300 sensor at the very extreme high-ISO range, with a little more noise reduction post-processing required. And if video is what you’re looking for, the K7 completely blows away any of the entry-level and midrange cameras (save Panasonic’s GH1) in terms of features and control, though quality remains to be seen. 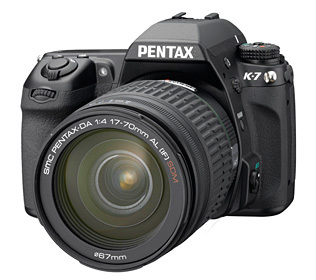 The one drawback of the K7 may not really be the camera itself, but the Pentax system associated with it. Pentax has got a lot of interesting and high-quality lenses (though they’re on the pricier end of things), but doesn’t have anywhere near the selection that big systems like Canon and Nikon have, and doesn’t even cover all the basics, which at least Sony’s Alpha and Olympus/Panasonic’s Four Thirds do. This is becoming a bit less of a problem, however, as third party manufacturers like Sigma and Tamron increase the number of alternatives available. This entry was posted on Thursday, May 28th, 2009 at 18:18	and is filed under Market Analysis. You can follow any responses to this entry through the RSS 2.0 feed. You can leave a response, or trackback from your own site.